This one was suggested by Minaithelan. Getting around with guild members or a party in general, can be tough. If someone in the party hasn't purchased fast riding or fast flying, your group has to wait for them to get where you're going. Both of those upgrades are fairly pricey, even in an age where making money is reasonably easy. If you have a stable of alts, buying fast movement speed is a cha-ching proposition. So, many people opt not to buy the faster mount speeds. It's a matter of economics. There are, however, ways to get your slower guild mates to their destinations. Two-seater mounts, such as the Grand Black War Mammoth, whose speed is based on the driver, not the passenger, can get slower people across the ground fast. We use these when we raid Silvermoon City. For flying, hop on a Sandstone Drake, for instance. No one needs to be left behind, unless... you are traveling over the water. 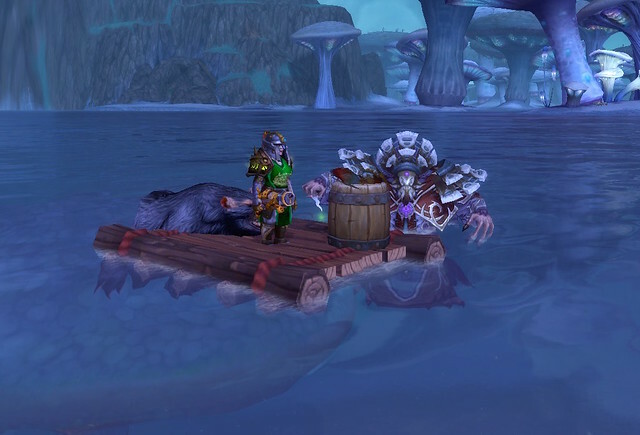 Currently, there is no two-seater water mount. There is, perhaps, not a demand for one, but there's not really a demand for the mammoth or the drake. They just are, which means, there doesn't have to be a precedent for need to have a mount. The raft shown above you buy from Nat Pagle in Krasarang Wilds, once your reputation with The Anglers gets to revered. The raft works in every body of water and is a relatively fast mode of transport. If you have to cross water and then run up to something, you don't have to dismount since the raft disappears once you hit land. It lasts 10 minutes, so you do have to watch your time while using it. And once you attack something or get attacked by something, it despawns. It would be way cool to have a two person raft. You could fish together but, more importantly, you would be able to ferry around someone who doesn't have fast riding or a water mount. It would be neat to be able to attack from the raft, but we'll take just being about to raft down the river like Tom Sawyer and Huck Finn.